RS-232 connections can be notoriously difficult and frustrating to troubleshoot. Please follow the instructions below systematically. The first thing you should do is to press stop in the start/stop tab and then switch to the event log. 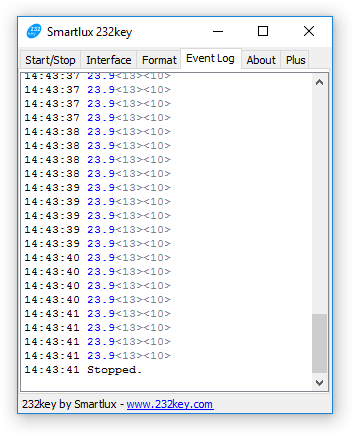 The event log is a very useful troubleshooting tool. 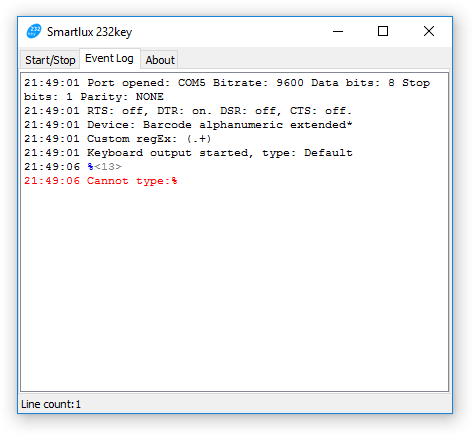 In the example below, you can see that 232key has received a total of 10 lines of data from the connected device. Two lines contained measuring values which were extracted and typed by 232key ("70.8" and "102.1", shown in italics and blue). Non-printable ASCII control characters are shown in pointy brackets ("<13><10>" = carriage return and line feed). Depending on what you see in your event log, please refer to the appropriate section below. *Applies only to Plus version. All interface parameters (bits/s aka. baud rate, data bits, stop bits, parity and flow control) match the settings in the input tab in 232key. Try enabling hardware handshaking in 232key as some devices require it (e.g. Sartorius balances). Data transmission is set to the correct mode. You want data to be transferred upon pressing a button on the device (sometimes called "key mode") or automatically at the end of a measurement or reading ("auto mode"). Modes which you do not want might be called "stream" or "continuous mode" where data is sent continuously several times per second, "interval mode" where data is sent automatically in certain intervals or "command mode" where data has to be requested by the software. Adam Equipment CPWplus: Set the scale to "trn 3" (default setting is "trn 1", RS-232 port deactivated). Confirm that all other settings match the default values in 232key. Data content is set correctly. On some devices, you can chose which data should be sent, e.g. 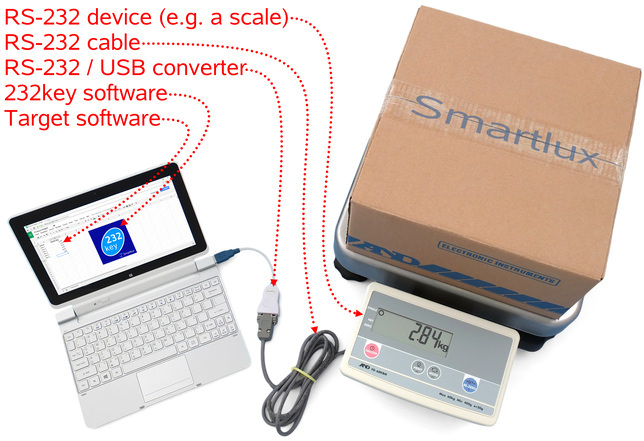 on some scales, you can send the net and gross weight as well as the date and time. Generally, 232key automatically extracts the first number it encounters in the data sent by the device, so you should make sure the value you want is sent as the first (or only) value. Ohaus Scout STX precision portable balance: Select "numeric value only" to make sure the balance only sends the weight. To make sure that your device is working correctly, you could also try observing the RS-232 output signals with a converter equipped with Tx/Rx LEDs, an RS-232 interface tester, a voltmeter or an oscilloscope. A surprisingly common problem we've encountered with inexpensive scales were faulty, counterfeit MAX232 ICs which resulted in data transfer failures at the signal level. RS-232 cable: Make sure the connectors are fully plugged in (sounds stupid, but this is a common mistake). Also verify that you have the right kind of cable for your device. Unfortunately, even cables which look completely identical on the outside can be wired differently. 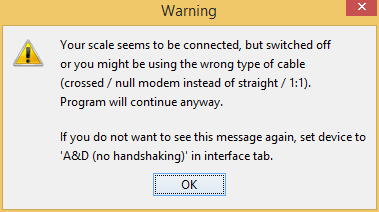 If you're using a crossed ("null modem") cable where a straight 1:1 cable is required (or vice-versa), the connection won't work. RS-232 to USB converter (if used): Make sure the driver is up to date. Try unplugging and plugging the converter into the same USB port. If this doesn't help, try unplugging and plugging it into another USB port (it might now show up as a new COM port on your system, don't forget to specify this port in the input tab). If your converter is connected to a hub, try connect it directly to a port on your PC. 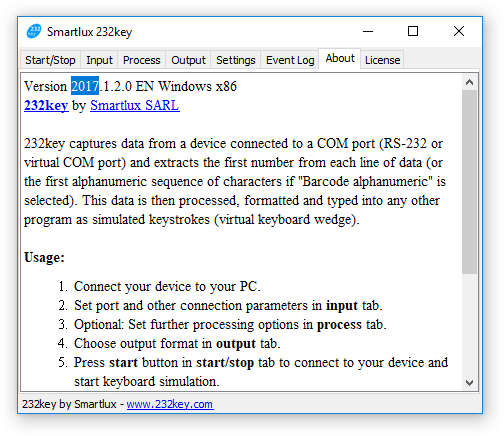 232key: Verify that you have selected the right COM port as well as device and interface parameters in the input tab. Try selecting the "generic" device. If you suspect that a bug in 232key is causing the problem, try using a terminal program like hterm to communicate with your device before submitting a bug report or contacting us for help. If the terminal program doesn't receive any data either, the issue is not caused by 232key but by one of the other points listed above. Please understand that we cannot remotely diagnose this kind of "no data received" issue for you and that it usually has nothing to do with our software! The device you've selected in the input tab expects numeric values only (this is the case for all devices except for "Barcode alphanumeric" and "Barcode alphanumeric extended"). You've modified the regular expression to match non-numeric characters. You did not remove these characters by entering them in the remove field in the process tab. What happened then is that 232key tried to convert the captured non-numeric data into a number, which produced the error. If you want 232key to type a number, you have to remove the matched non-numeric characters in the process tab (in the pictured example, you'd enter "/" in the remove field). If you want 232key to type all characters as captured, change the device in the input tab to "Barcode alphanumeric" or "Barcode alphanumeric extended". This message means that 232key has captured a character which it cannot (currently) type. The "Barcode alphanumeric" device can type characters A-Z (case sensitive) and 0-9, while the "Barcode alphanumeric extended" device can also type a-z and several other characters (see entry under "additional devices" here for a complete list). If a character outside this range has been captured, this error message is logged and the character is ignored. We're constantly working on adding further characters to the "Barcode alphanumeric extended" device. Due to the low-level nature of our keyboard simulation and the many keyboard layouts in use around the world, this can be surprisingly complicated. Please specify the correct terminator in the input tab. You can enter any decimal ASCII code. See our documentation for further information. If the "unsent data" message is followed by unexpected characters and numbers in <angle quotation marks> (non-printable characters), your connection parameters are wrong. The most likely culprits are the bits/s and data bits settings in the input tab. Please refer to the manual that came with your device to find the correct settings. These errors appear if the data received by 232key does not match the expected format at byte level. 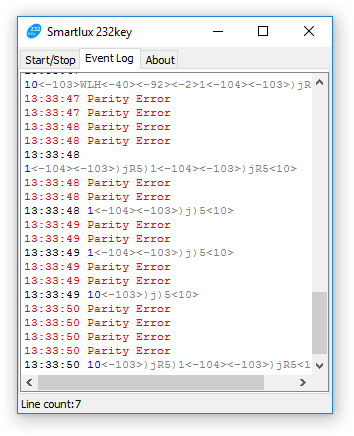 If you see a long list of these errors, your connection parameters in the input tab are most likely wrong. Please refer to the manual that came with your device to find the correct settings. If these errors only appear sporadically, this could mean that your data has been corrupted. Try configuring your device to send only the value you need. Create a custom regular expression to capture only the data you want (requires a Plus license). Currently, only the "barcode alphanumeric" and "barcode alphanumeric extended" profiles supports letters. Please make sure one of these devices is selected in the input tab. As you can see, 232key extracts part of the date, the balance ID, part of the model no. 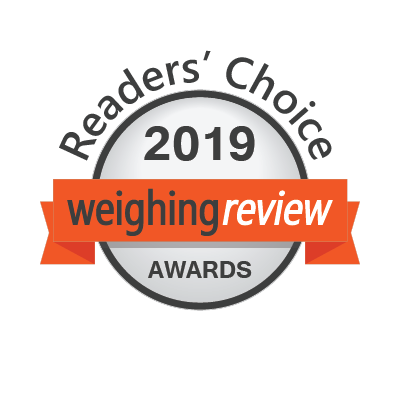 and finally the weight. Configure your device to send only one value. The scale used in our example can be set to transmit the "numeric value only" (and then sends only the weight, a setting which works fine with the default "Ohaus" profile in 232key). Contact us so that we can analyze the data and build a special device profile. Please send us the content of the event log tab and the name of your device and manufacturer. You can see that data has been received from your device, but nothing is shown in blue and italics (i.e. no data has been extracted and typed by 232key)? Please make sure that you've selected the right device profile in the input tab: The "general" device profile is meant to be used with measuring instruments and only supports numeric values. The "barcode alphanumeric (A-Z and 0-9)" device profile supports characters A-Z (case sensitive) and digits 0-9 while the "barcode alphanumeric extended*" profile supports all printable ASCII characters. If you only see a lot of values in pointy brackets, please ensure that you device is sending data in ASCII format (currently, 232key does not support other formats like Modbus RTU). The event log looks fine, i.e. 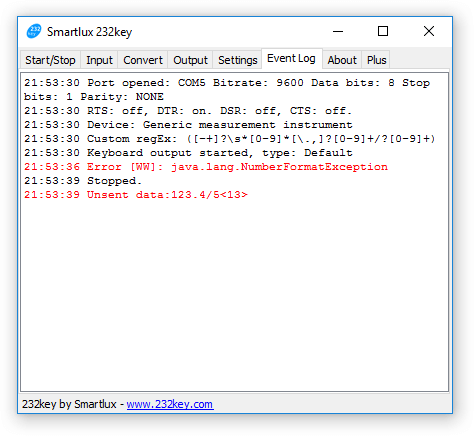 you can see that data was received from the connected device and that 232key extracted the desired value (shown in blue), but nothing is typed into your application? Make sure that your target application has focus while 232key is running in the background. If you start typing on your keyboard, the characters should appear in your target application. Please try using another target application (like notepad) to see if the problem persists. 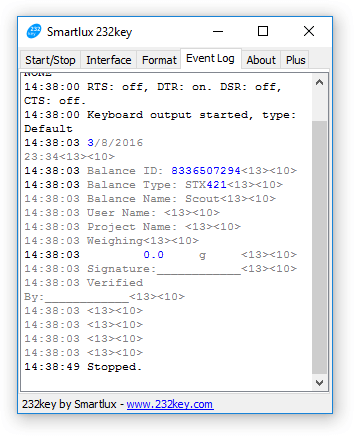 Some applications may capture keyboard input and prevent 232key from working correctly. Make sure that no error messages appear in the event log (e.g. " cannot type" errors). Try changing the keyboard setting in the output tab to match your keyboard layout or try selecting "All (compatibility mode)". Verify that the start with key defined in the input tab is not moving focus away from where you want the data to be typed. Consult its manual to switch to a mode where data is only sent when a key on the device is pressed (or data is sent automatically, but only once). Note: Some devices may only have a "continuous" mode and unfortunately can't be used with 232key at this time. Please make sure you're using an operating system supported by 232key. If that's the case, try disabling your virus scanner (should this solve the problem, please let us know which virus scanner you're using). 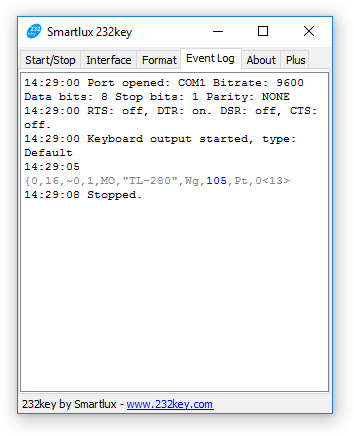 232key needs a (virtual) serial port to communicate with your device. Make sure the port shows up in the device manager on your system. If you're using a RS-232/USB converter, check that it is plugged in correctly. Your port is being used by another application. Check that you've selected the right port in the input tab and that no other programs are using this port. The port you selected in the input tab is not valid. This could happen if you disconnect a RS-232/USB converter while 232key is running. 232key shows this message if it can't detect an A&D device at the specified port. Please make sure that you've chosen the right port in the input tab and that the cable is connected to your device and computer. If you receive this error message, but your A&D device is working properly as the program continues, please tell us which A&D scale or balance you're using. 232key has detected an A&D device at the specified port, but this device does not respond as expected. It could be switched off or you might be using the wrong type of cable. A&D scales and balances usually require a straight cable and will not work with a crossed (null modem) cable. Note concerning A&D balances with power safe mode: Power safe mode is currently not detected by 232key, this message will only appear if your balance is unplugged. 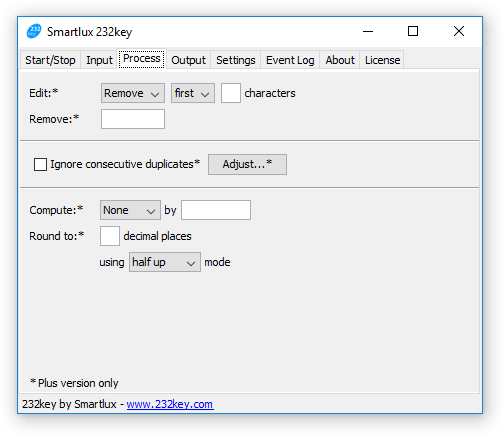 All settings you make in 232key are saved and loaded automatically. If one or more of these saved settings are not valid, the error message above is displayed and the program uses the default setting. This can also mean that a trial license you used has expired. Access to the registry was denied. The program cannot load the settings your settings. Please ensure that access to the registry (232key) or ProgramData folder (232key MU) is not blocked by a virus scanner or similar application. Your settings are automatically saved when 232key is closed. 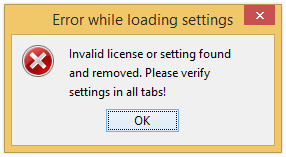 If access to the registry (232key) or ProgramData folder (232key MU) is denied, you'll see this error message. Please ensure that access to the registry is not blocked by a virus scanner or similar application. Older versions don't accept newer license keys. 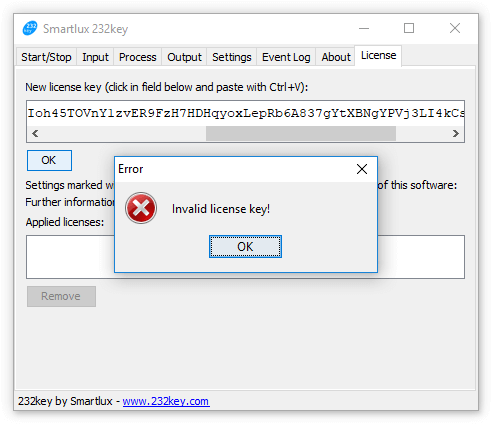 Please update your software by downloading and running the installer for 232key Plus or 232key MU (depending on which license you've purchased). You've not copied and pasted the complete license key or your email client has problems displaying it correctly (this can happen in rare cases when FastSpring's original email with the license key has been forwarded to you in HTML format). Please copy the entire key from the email you've received from FastSpring. If the error persist, please contact us and we'll resend you your license key as a text file. However, first make sure you're not using an outdated version of 232key as mentioned above!